Some WarningZ Philosophy…Or..Why everything needs a ‘Time’! All tasks and events need prioritising. Success in life is ‘Getting Things Done’ at the ‘Right time’! First you have to recognise that something needs doing; and then you most probably need to record it. Then you need to prioritize and then ‘Get Things Done’ (GTD) before you are overtaken by time. The simplest GTD is the paper list. And there have been many attempts to improve on the humble written list over the years – the ultimate being the 90’s Filofax. With the coming of PDA in the 00’s most software developers simply created an electronic version of the original paper list. You record the task; you prioritise it; you ‘Get It Done’ and you update your list. WarningZ is the first ‘App’ since the coming of the PDA that changes the cycle. We can’t help you recognise a task although browsing our Templates might give you a good idea of the range of tasks WarningZ can look after. We can, however, help you prioritise your tasks. 99% of tasks have a deadline! Even those ‘nice to do’ items have a shelf life. So the first stage to prioritisation is to give everything an expiry date. Even if it is ringing your friend for a chat you should decide when you would ‘like’ to do it by. Then allocate an amount of time to complete the task before the deadline. Then, if you need to prepare before starting the task, allocate an amount of time for preparation. This will give you a timeline leading up to the task deadline. 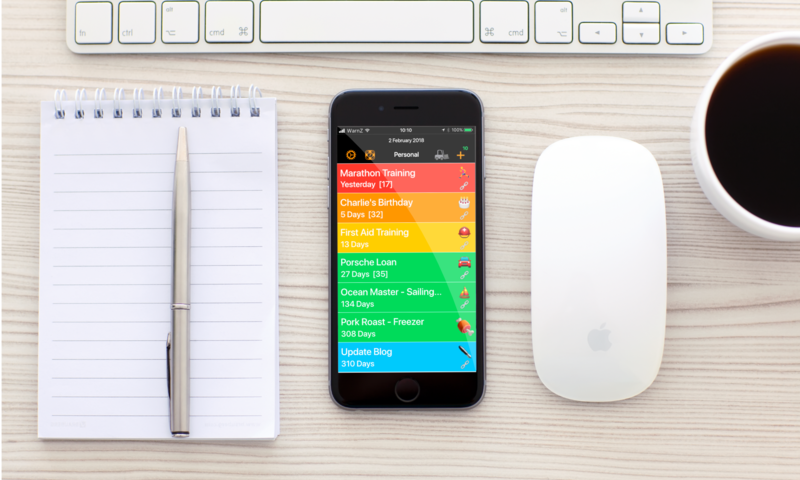 WarningZ then overlays those timelines and shows you clearly which task you need to concentrate on. WarningZ then lets you ‘Get Things Done’ by letting you link to all the resources you need to get it done. To ring a friend – add the number to the WarnZ – don’t go hunting for it in your contacts. To renew an insurance – add the website and the previous insurance documents – have it all to hand when you go to the website. To submit an academic paper on time – add the email and link to the document in the cloud……….WarningZ will create the email and add the document to it for you when it’s time to submit. Think of WarningZ as a file cabinet of information where the information you need is always at the front of the top drawer. No hunting through wondering what you filed the information under. And when you completed the task WarnZ will safely file the information away until you need it again. Even if the task doesn’t repeat you can simply archive the information in the bottom draw just in case! And for those of you (Clear Users) who just can’t give a deadline to a task then you can still create a WarnZ without adding a date – and manually decide where to place it in the column. But that’s a lesson for another day. And a bit luddite! After, what is it, 4 years? We’ve gone to Beta. A bunch of generous individuals are podging buttons and adding their events and tasks to what will be the best ‘Life Manager’ on the market. So far no hiccups; only minor SnagZ…. so just the store and a few other minor 😳 things to add. Shawn has gone off somewhere to lie down after much code crunching. He deserves it. Meanwhile I’ll keep working on gfx and support! What do we mean when we call WarningZ: The Life Manager? Let’s be brutal: We’ve tried the best Calendars, Reminder and To Dos Apps out there…….and they all come up short when you really need to ‘get things done’. We all need something that lets you use the power of the web, the cloud, and your iPhone or iPad in an ‘App’ that ties all the strands together. We don’t want to just plan or to just be reminded to ‘get things done’ we actually want to be able to do it easily. This is what WarningZ is all about………….tying together all the resources available to you on your iOS device to actually get a result. We start by allowing you to plan ahead……… You know how long you need to prepare for a task so we let you set a caution (yellow) and a warning (amber) period prior to the expiry (red) date of your task. Some tasks take a month to prepare for………some take a day. So you set the periods you require. WarningZ then uses these periods to prioritize your tasks. If your task hasn’t entered a yellow caution or amber warning period it is shown as green – no snagz! Once it enters a caution or warning period you will get an alert and notification! (The today screen always shows an overview – we call it the ‘panic meter’!) The task (WarnZ) changes to the appropriate colour and is displayed above the greens on the screen (column). This way you will get notification of task with appropriate lead times. You may well have a WarnZ that is showing yellow with 2 weeks until expiry, and that is displayed above a task that is green but with only a few days to go to expiry! Just like real life: you need more anticipation to book a medical check up than to get on the web and pay your car insurance! WarningZ has powerful repeat functionality. WarningZ allows for all types of repeats from simple yearly repeats, to complex repeats driven by professional competencies. Do you need to be reminded 90 days after you last practiced a skill – WarningZ can do that! So how does WarningZ then help you get the task done? Once you have created your task you can set a link (or action) against it! In the case of the doctor’s appointment that link may be the contact you have created on the phone. When the WarnZ, reminding you of your medical check up, changes to yellow, you get a notification or alert! You then open WarningZ to see what you need to do; tap on the link and WarningZ starts the call to your Medical Practice! For paying your car insurance; you might set the link to take you to the webpage for your car insurance company! WarningZ does more with links. To help you get a task done you can attach notes, photographs, documents and more to each WarnZ. So for the car insurance WarnZ; you might have attached the ‘pdf’ of your previous car insurance policy so that you have the details to hand when you renew. And if you set an email address link (or multiple email addresses) then WarningZ will add the contents of any note, add any photograph or document to the email. Pre-compose the email by putting the text in the note! Some developers make a check list and think this is an entire App. With WarningZ, it is just one of the many handy features to help you do the stuff you have to do quickly, so you can get back to doing the things you want to do! WarningZ is a universal app so it works on your iPhone and iPad (and we plan to have it working on Macs in the future). And, using iCloud, any WarnZ with its links created on one device will be available on all your devices. Naturally; an update on one device will show on the others as well. WarningZ is THE Life Manager. Welcome to the WarningZ Blog. Visit here for our latest news on the development of WarningZ. Find out what we have planned and when. And our thoughts on not only WarningZ but the whole Apple ecosystem.